JOURNEY OF HEROES: the Story of the 100th Infantry Battalion and 442nd Regimental Combat Team, was created to raise awareness of the nisei soldier, most specifically the exploits of the 100th/442nd Regimental Combat Team, and to do so in a modern, engaging, and accessible format for a wide audience. It is a comprehensive, historically accurate, 30 page book featuring original art, highlighting the achievements of the United States' most highly decorated unit for its size and time in combat through 70 years of history, from pre-WWII to present day. 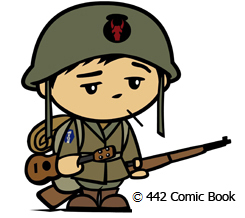 The book is internationally acclaimed, having been in the media in Italy and Japan as well as the United States, and has made appearances at numerous Japanese American and/or nisei veteran museums and cultural centers, army museums and historically significant sites, and has exhibited at the prestigious Comic Con International in San Diego in 2013.